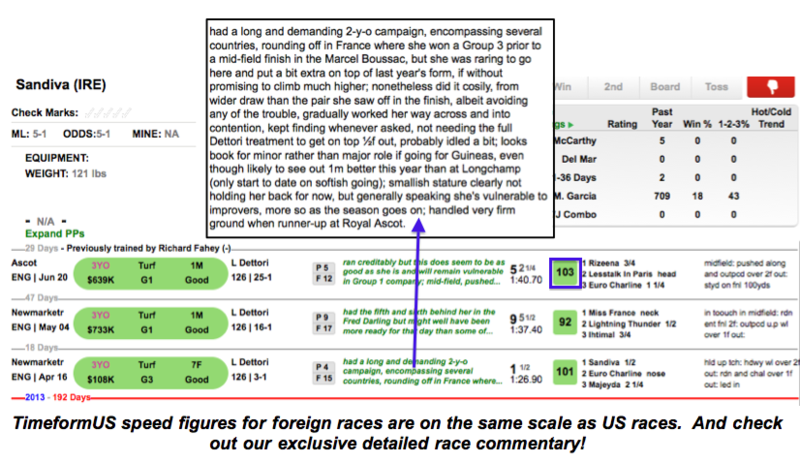 Saturday's running of the Grade 1 Diana drew a field of 10 fillies and mares and could hardly have come up a stronger race. 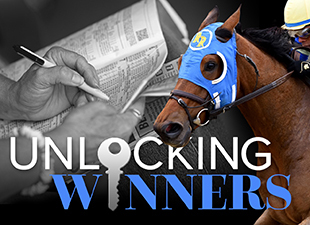 Each one of the 10 entered is already a graded stakes winner, half of them at the Grade 1 level. Both Somali Lemonade and Discreet Marq are contenders, so let's start with them, as they may hold the keys to this race. Somali Lemonade has turned her career around with the addition of blinkers for her 5yo season. 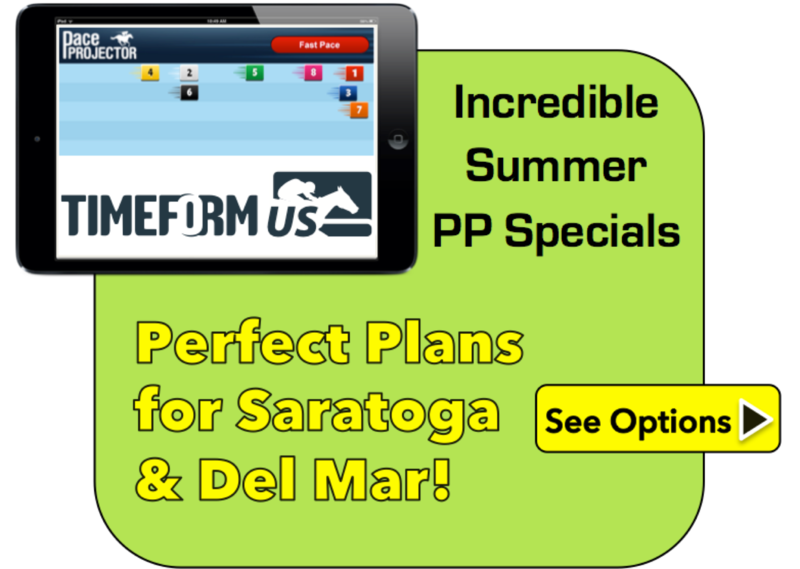 She has shown more speed with her new equipment, and parlayed her new running style into a Grade 3 win at Pimlico and two other solid placings at the graded stakes level, including a game third-place finish in the Grade 1 Just a Game last time. She set a solid pace that day with pressure throughout, and dug in determinedly at the end to hold onto her placing. The question surrounding this race is: Will she be allowed to get more comfortable up front and by so doing become more dangerous, or will Discreet Marq, who was up there applying pressure to her throughout the Just a Game, come after her early again? If she gets control, she's a big factor. But with Discreet Marq in the field, it feels as if she is in for more of the same in the Diana, and that makes things very tough for her. Same goes for Discreet Marq, who has shown in the past that she can rate and run but may be in a tough position in this race, having to keep Somali Lemonade honest up front. Emollient is one of those Grade 1 winners, although the American Oaks field that she defeated last year was hardly of top-level quality. She also has some speed and could be a pace factor in this race if ridden with that intent, but she has always been something of an in-and-outer. In her defense, when she shows up with her best stuff, as she often seems to do on synthetic surfaces, she's quite good. 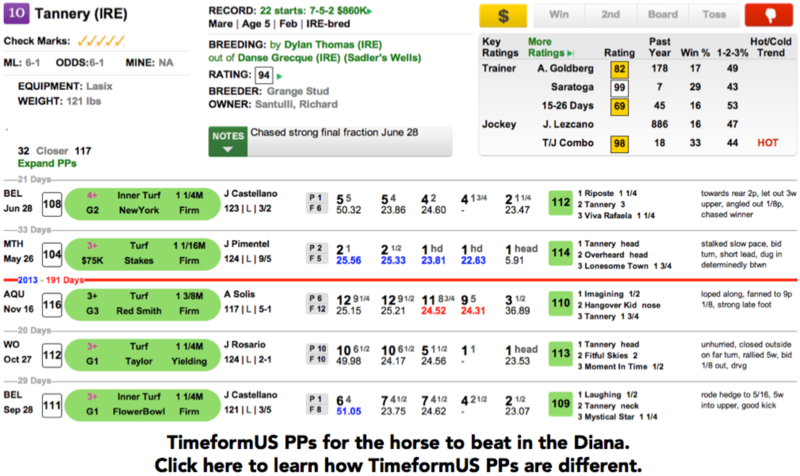 Her top TimeformUS Speed Figure of 111, earned in her valiant BC Filly & Mare Turf effort last year, gives her a big chance in this race--if she can repeat it. These horses are all contenders in the Diana, but we aren't sure what we'll get from any of them in this race, which makes it tough for us to back them with any confidence. Because of that, we will go to a couple of different horses for our play. Tannery is as consistent as a horse can be, putting up TimeformUS Speed Figures between 104 and 114 for each and every start dating back to the end of 2012. She was a very good 2nd last time out, in the Grade 2 New York, as she wound up in the unenviable position of having to chase a very good horse through a strong final fraction. She came away second-best on the day, but it was yet another good effort for this horse, who seems to show up with nothing but good efforts. We think she is the horse to beat, in a lot of ways, and will make her a major part of our play. The other horse for us is Alterite, who returns from the layoff for Chad Brown. Alterite just missed vs. Group 1 company in France as a 3yo before arriving stateside to compete in the better turf races for her division at the end of the year. That move paid off right away, as she came through with a much-the-best win in the Grade 1 Garden City over, among others, Discreet Marq and Emollient. From there she went to Keeneland for the other major prize for 3yo turf fillies, the QEII. Racing wide and too close to an enterprising pace that day, Alterite stayed on gamely all the way to the end but fell short of holding off the closing winner. She then backed that race up quite well when 3rd in the Breeders' Cup Filly & Mare Turf behind Dank and Romantica. The layoff is a big question for her in this race, and we would not be thrilled to take her at the ML price of 3/1, but in a field this loaded, she may drift to a better price. If she does, we'll be there to make sure she gets into our play. We will also include Abaco somewhere, as she has developed strongly for Shug McGaughey and exits a fine try going longer last time behind the highly promising Riposte. We would like to take Alterite on top, but we will wait to see how the wagering shakes out before solidifying our position on her. At the ML odds, it's a pretty easy call for us to make Tannery the focus of our play. Abaco is our backup in the multis and our main use on the bottom of our tickets. While we would prefer to offer more sophisticated advice than "Play the Euro," Sandiva (#7, 5-1 ML) is our selection in the G2 San Clemente at Del Mar this Saturday. The San Clemente features a competitive field of 12 three-year-old grass fillies going one mile on the new, widened Del Mar turf course. Although this is a good betting race, the Grade 2 rating is appropriate, as there appear to be no budding superstars in this group of young turfers (and that includes our selection). After a successful two-year-old season that featured a win and a place in a pair of Group 3s, Sandiva found the going much tougher when clashing with Group 1 fillies in Europe. Note her recent defeats at Newmarket and Ascot. But these efforts need to be put in proper perspective. Sandiva finished only 2 and 1/4 lengths behind in her most recent start. The effort earned her a TFUS Speed Figure of 103, which, if repeated, would make her extremely tough in this spot. Now she ships to the US and races on 29 days' rest for a relatively low-profile trainer, and she sports no workouts. There is some reason for skepticism, but our conviction that she's a prime contender is buoyed by the fact that she may actually prefer the harder surface she is likely to find on the drought-stricken West Coast. Her smashing wins as a two-year-old were all achieved on dry turf. This is enough to make her the most likely winner in the race, though we will not back her with a heavy stack if her odds drop below 3-1. As far as the others are concerned, we think there are some interesting longshots in here. Concave (#5, 20-1 ML) has been managed rather curiously. After a strong maiden score on today's surface, she was entered in non-grass races six times. Finally, she's back on what may be her preferred surface. Her last race, seven days ago, is a throw-out, and we think she's a speculative sort of use on the off chance that she has been crying out for the turf. Istanford (#8, 8-1) is a must-use in all positions. The Pace Projector puts her on a clear lead, and while it won't be easy to wire this bunch, we give her a reasonable chance of doing just that. All of her recent efforts have been at longer distances, and she is 2-for-2 at a mile on grass. Her trainer, Michael Stidham, has been hot as of late. If Sandiva gets played hard, as she might, horseplayers could do much worse than keying on this one at 7-1 or 8-1. Note that Rafael Bejarano takes the mount. If Istanford were just a few points faster, she would be our key, but she has five weeks of rest and should be ready to put forth a good effort at her preferred distance. Expect her to hang around for a piece, maybe more. The last horse to mention is Tiz Kissable (#11, 15-1). Her poor outside post position notwithstanding, there's plenty to like about this gal. She sports a nice, improving pattern of speed figures and appears to be sitting on a career top. She has been training well and gets 48 days of rest coming into this clash. If she can somehow avoid going 8-wide, she figures to be one of the fillies whose name will be shouted out in earnest by Trevor Denman in the final hundred yards. Exacta and Trifecta keys, #7 with 5, 8,11 in all spots. Simple exacta and trifecta boxes with our four uses. And consider #8 Istanford or #11 Tiz Kissable as keys if the odds warrant.